Nancy Gideon... Romance By Any Other Name: WeWriWa: It’s a Dead Man’s Party for my MIDNIGHT GAMBLE Sale! 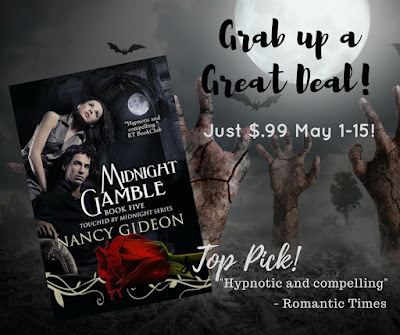 WeWriWa: It’s a Dead Man’s Party for my MIDNIGHT GAMBLE Sale! I love a party and I LOVE a sale. So, when my vampires throw a party when their books go on sale . . . Dead Man’s Party time!! 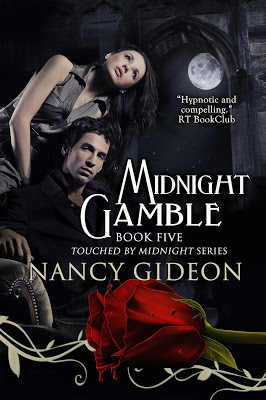 That’s where the heroine of MIDNIGHT GAMBLE finds herself when half human, half vampire Daywalker, Nicole Lavoy is tracking down the undead murderer plaguing 1920’s New York to bring him to her father’s tribunal to be tried for his crimes against humanity. Her hunt leads her to a club where the guest are . . . unusual. Time flowed toward dawn on a seemingly endless supply of champagne and Crème de Menthe, the bouncy strains of “Ain’t We Got Fun,” blending into the steady hum of conversation as Frederica listened on an entirely different level. As she moved between the elegant fox trotting couples, she wasn’t hearing the scuffle of their feet flying across the lighted dance floor, she was focused on a more basic rhythm, one that beckoned to her on a subliminal level in a hot, hurried tempo. Heartbeats, fast, flurried, human, the blood of their existence pumping in time to the flinging elbows and twitching hips. The unmistakable tune of life. But as she wove through the crowd of close to eighty bodies pressed tightly together in the artificial moon-drenched glow, not all greeted her with that resounding pulse of the living. Some met her mild queries with another force so strong and fierce it was almost physical. That relentless surging need to feed pounded as purposefully beneath an Ivy League jacket or within a shimmering panel of pastel silk as the human heart did within the normal breast. Vampires. The glittering room was filled with them. Okay, so I adore “Back to School” with Rodney Dangerfield and a very young Robert Downey. But it was Oingo Boingo’s tune that really caught me, especially when I discovered lead singer, Danny Elfman is the music guy behind most of the biggest movies in Hollywood, including MEN IN BLACK, all things Tim Burton, The Simpson and SPIDER MAN 3. Who knew? 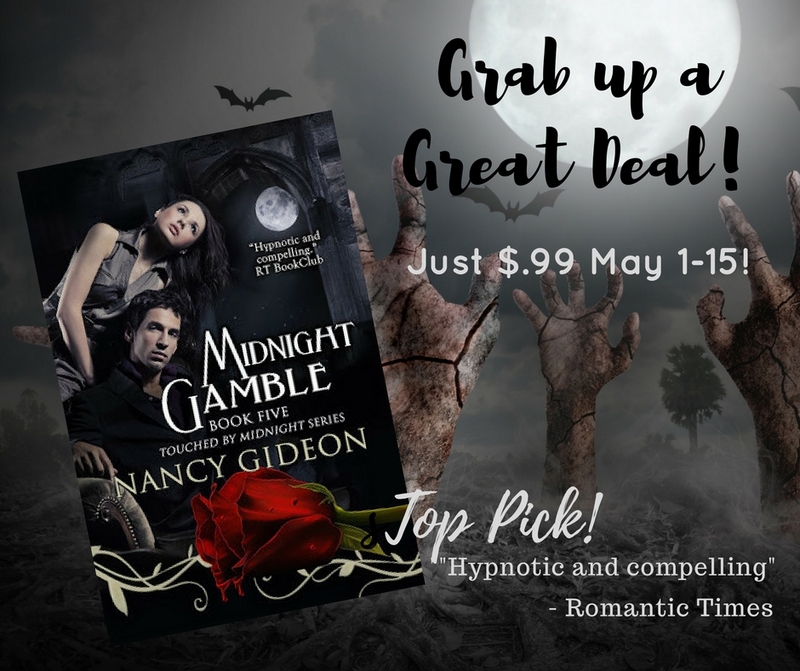 MIDNIGHT GAMBLE will be on sale for $.99 until May 15 so it’s a great time to sink your teeth in for a taste of vampire romance. I’ll be sharing another tease next week. Looking forward to seeing what the rest of my Warrior pals are up to now that I have a weekend at home. Oh, that's a scary situation! Reminds me a bit of a scene from Blade. Ooooh! I'll have to rewatch and see. Oh, yeah. That beginning when all the blood comes down through the sprinklers! Love Blade! Nice job with the senses - I can feel that music and the heartbeats. This is some beautiful writing. David Bowie . . . oh yeah! Oh, you mean the word. Distracted me for a minute there. Thanks, Christina. It was so much fun to picture while I was writing it. 1920s: dance, music, bootleg liquor. Wow. That song is perfect. You always use the senses so well. Oooh, I LOVED this snippet. THe mood was perfectly established and then the spooky subtext of the beating hearts versus the vampires...YES. Excellent. I'm a big Oingo Boingo fan from back in the day. Danny Elfman rocks! Your snippet was wonderfully sensuous and creepy. Not exactly my type of party, either! This is a great excerpt. Lovely writing. It makes me wonder how much repeat business this club gets! LOL, Ed! A sucker born every minute so probably lots! A dead man's party all right. I'm intrigued to know more. More next week . . .